The TV-4501 has an unobtrusive grey case and monitors temperatures from -25 to +50°C and relative humidity from 0 to 100% using built-in sensors. The coated RH sensor offers good resistance to moisture and condensation. 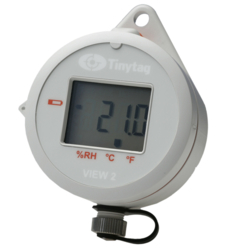 Like the rest of the View 2 range, this accurate and reliable unit has a display providing a visual readout.